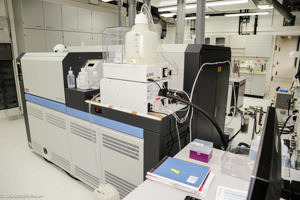 The GeoZentrum Nordbayern is equipped with new, purpose built metal-free Class 1000 geochemistry laboratories, and state-of-the-art magnetic sector and quadrupole mass spectrometers. 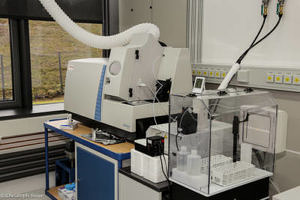 These instruments are used to measure the isotope composition of elements such as Sr, Nd, Pb and Hf, as well as mass-dependent isotope variations in elements such as Mo and Sr. A quadrupole ICP-MS is used to measure trace element concentrations in geological materials. For a list of current research projects and recent publications from our laboratory, please see our homepage. We undertake work for external users, and are happy to discuss collaborative projects. Please contact us for details. ng 234U/238U, and 230Th/232Th (typically 5 x 10-6 in volcanic rocks). Our thermal ionisation mass spectrometer has 9 Faraday detectors and a secondary electron multiplier, and is used for the precise isotope analysis of small (10-100 nanogram) quantities of Sr, Nd and other rare-earth elements. 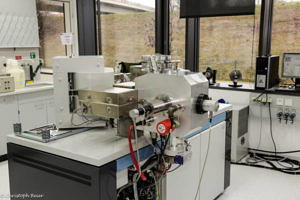 The GeoZentrum Nordbayern operates a Thermo X-Series 2 quadrupole ICP-MS, equipped with a collision cell for interference reduction. Samples are dissolved in 2% HNO3 and introduced into the plasma via a Cetac Aridus desolvating nebuliser system. This provides greatly increased sensitivity, allowing samples to be analysed at high dilution thus decreasing matrix effects and instrument drift, and also removes many solution-based interferences. An ESI autosampler and FAST valve system allows rapid sample throughput without long washout times between analyses. The instrument is also equipped with a hydride generation system for analysis of Se, Te, As, Sb and Hg. Samples are prepared in metal free Class 100 laminar flow cabinets, using Teflon distilled reagents. Most of the samples we analyse are silicate rocks, but we can measure a wide range of different trace elements in many different sample types, from iron meteorites to river waters. Using preconcentration methods, we can expand the range of elements and sample types we can analyse. For example, preconcentration of rare earth elements using thulium spike and ion exchange columns allows measurement of the extremely low concentrations of REE in abyssal peridotites. Co-precipitation of Se and Te with Ce(OH)3 allows us to measure the concentrations of these ultra-trace elements in geological samples.